Roxanna (Rocky) Alexander is a painter of vibrant watercolors and oils. She was born and raised in the Bay Area of CA, received her AA in Architecture from College of San Mateo, a BLAEP in Landscape Architecture with minors in Studio Art and Civil Engineering from Utah State University. 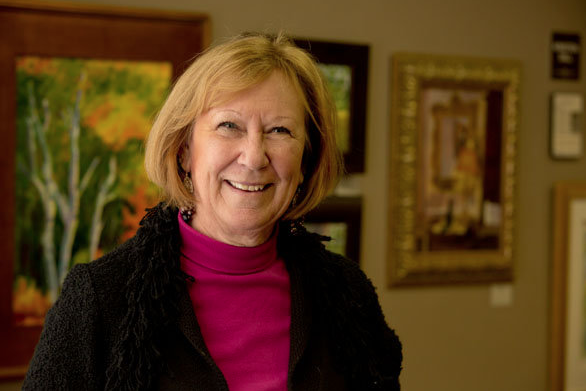 She spent just under 20 years in the Denver area of CO painting when the Landscape business slowed down and has resided in Wake County since 1993, painting and instructing full time. Rocky's work has a lot to do with color and more to do with what she loves. She has had Koi ponds for many years, is mesmerized by evening skies, relishes working in her garden at sunrise, is nostalgic at the sight of local, historical old dwellings, saddened by their demise and loves chocolates. And those elements inspire most of her paintings. Rocky is a signature member of the Watercolor Society of NC, was a founding member and past president of the Fine Arts League of Cary, a juried member of Artspace in Raleigh, and is a member of FALC, Clayton Visual Arts, Visual Arts Assoc., WSNC, and Associate member of National Watercolor Soc. She has been an art instructor for the Town of Cary for 16 years, the Arts Council of Wayne County, Nicole's Studio in Raleigh, Jerry's Artarama's Art of the Carolinas convention, a demo artist for Cheap Joe's in Boone and Jerry's Artarama in Raleigh. Rocky's paintings have been juried into many local, national and a few international competitions and she has won several awards. Her paintings and jewelry can be seen at Nicole's Studio and Artspace in Raleigh, Waverly Artists Group in Cary (paintings only), JJ Jiang's Village Art Circle (jewelry only) and The Nature of Art in Holly Springs.